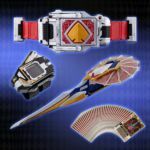 Complete Selection Modification Kamen Rider Blade BlayBuckle & Weapon Details Released! 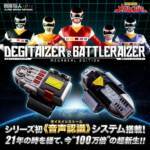 Premium Bandai has opened their official page detailing the next release in the Complete Selection Modification series! *The full assortment of Rouze Cards. A video demonstration of the CSM Kamen Rider Blade selection is included, with actor Takayuki Tsubaki reprising his role as Kamen Rider Blade once again. The Complete Selection Modification BlayBuckle, RouseAbsorber & BlayRouzer set will be released in July 2019! The price is a modest 49140 Yen before shipping and fees. Super Minipla Jet Icarus & Jet Garuda Official Images Online! The latest entries in the fan-favorite Super Minipla collector series have been revealed in full! First up is the main Mecha from 1991’s Super Sentai series Chojin Sentai Jetman! The Celestial Fusion Jet Icarus is recreated in exquisite detail- with all five Jet Machines able to combine into either Jet Icarus or the attack craft Icarus Hawken. All of Jet Icarus’ weapons will be included with this release- the Birdonic Sabre, Wing Shield, Icarus Axe, Icarus Crusher, & Icarus Magna! Not to be outdone, the second Jetman Mecha will also be included in Super Minipla. This is our first look at the Minipla Jet Garuda! The powerful craft is able to switch from Bird Garuda airship mode to Jet Garuda Robot Mode. In addition, the Garuda can combine with Jet Icarus in two forms- first in vehicle mode to create the Hyper Hawken or in Robot Mode to create the Great Icarus! While price & release dates have not been confirmed at time of writing, it appears that the Jet Icarus is a standard retail release while Jet Garuda is a Premium Bandai item. Stay tuned to TokuNation for all Super Minipla reveals! 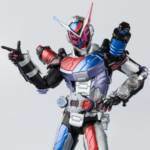 SH Figuarts Kamen Rider Zi-O Build Armor Release Details Revealed! Looks like it’s ARMOR TIME for SH Figuarts! After being shown off at a trade show last month, official release details have just been announced for Kamen Rider Zi-O Build Armor! This was the first alternate form obtained by the King of Time on his adventures across the Heisei Era, based on his highly-successful predecessor Kamen Rider Build. Figuarts Zi-O Build Armor is a Premium Bandai exclusive, currently the scheduled for release in May 2019! The price is a very modest 5940 Yen before shipping and handling. In one of the most emotional scenes in the entire series of Kamen Rider Build, everyone’s favorite hero, Kamen Rider Grease, used a power-up to defeat the ghosts of his past. The end of that battle forever left fans of the show with tears in their eyes. And next year they can relive that moment forever and ever as Kamen Rider Grease Blizzard will be available for purchase! Releasing in April of 2019 for 6,264 yen via Premium Bandai, you too can own your own Kamen Rider Grease Blizzard figure! He will come with changeable right hands as well as the Blizzard Knuckle attachment. Check out the title of the story for all the images and contact your middleman – orders open October 12th! 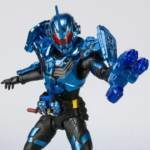 The secondhand man to Kamen Rider Evol, the villain of the fan-favorite series Kamen Rider Build, is getting his own S.H. Figuarts figure! Coming in April 2019 is S.H. Figuarts Kamen Rider Mad Rogue! He comes with all the accessories you would expect (Nebula Steam Gun, Bat Full Bottle, Steam Blade, and different hands). 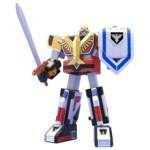 He is a Premium Bandai release at 6,264 yen. Orders open October 12th so contact your middle man! Click the title of the story for all the images! 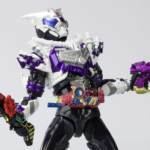 The Kamen Rider Build series is currently blasting out exciting episode one after another and in the latest episode we saw yet another power up form for Kamen Rider Cross-Z – this one being the Great Cross-Z and Dragon Evol Bottle combination turning Ryuga Banjo in to Kamen Rider Great Cross-Z! And in honor of the debut of the new form, Premium Bandai has put up an order page for the DX Great Cross-Z Dragon and Dragon Evol Bottle! This set will release in October 2018 for 3,024 yen. Contact your middle man today to get yourself this power up. 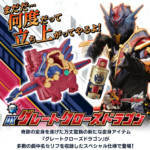 Important note – the DX Great Cross-Z Dragon and Dragon Evol Bottle have some relevance to the upcoming Kamen Rider Build movie, as a new Rider is teased in the preview images for this set! Count the medals, 1, 2 and 3! 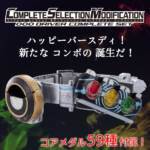 As you may recall, Bandai teased the release of a Complete Selection Modification OOO Driver just a few days ago. Ahead of the pre-orders going live, we have our first look at this piece thanks to some data mining from @_Erasu. 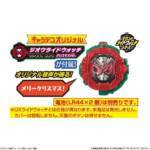 And when they call it a Complete Medal selection, they really do mean it: not only are they making all 9 Core Medals needed for OOO’s main Combos, along with a broken Taka medal, in addition to a faceplate for Kamen Rider Posiden(From Movie War Megamax), his Medals, and every Medal that was used over the course of OOO’s movie and Hyper Battle Video appearances. At the moment, we don’t know when this bad boy will be released or for how much but stay tuned, and we’ll bring more info once the pre orders for this highly anticpated item goes live.